In the age of smartphones, fablets and tablets, every doctor has one invariably carried with them. These techs have been used extensively by medical students and doctors. Life has become much more easier than a decade ago. No more heavy drug dose books, pocket books! A quick reference is available when needed and it has helped prevent many errors in medical practice because we know human brain has always a limit. 1. Medscape – The large database of the articles from the makers of emedicine-medscape online resource. It is the most useful and trusted resource available in android market. Updates are available regularly. Reliability is excellent. This application is easy to use , quick and handy. 2. Lexicomp– The database of drug doses , indications, side-effects and interactions. Trusted application world wide from Lexicomp. 3. Epocrates- The interactive drug doses database also includes drug-interactions and much more. Excellent applictions with frequent and free updates available. Its a cornerstone of your cellphone. 4. Skyscape- A new form of ebook library where you can keep lots of books and search from them in bulk. It is available partially free. You need to subscribe to get full library. 5. Quick LabRef – Lab reference for various parameters are most difficult thing to remember. Get this app and keep your life easygoing if you have problem with numbers. The huge database of parameters and their reference values. 6. ABG interpretation- Its a calculator where you put various parameters like pH, PO2, PCO2, HCO3 etc and it returns you the interpretetion of the blood gas analysis. Useful in critical care settings. 7. NICE Guidelines– The NICE guideline applications provides you a concise guidelines that are easy to refer to. Eg. UTI guidelines. 8. Qx calculate– Now you can calculate all the score and grading with this app called Qx calculate. Eg. Ranson’s criteria for pancreatitis, Childpugh’s Crieria. 9. Prognosis– A small and amusing game that provides you case scenarios and you have to solve through it. It allows you to get a stepwise approach and finally an information on the case, similar to Problem solving exercise. 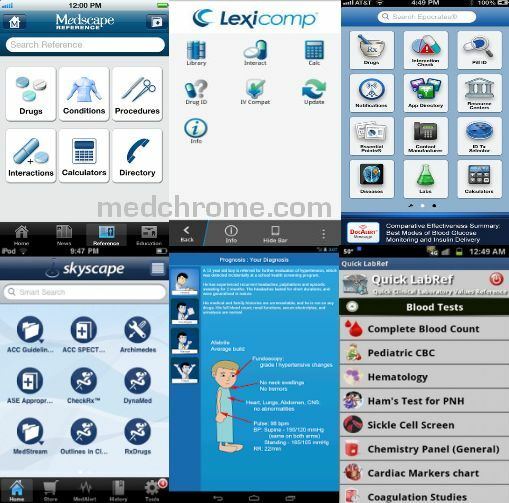 It has database for Medicine, Surgery, Gyne/Obs and Pediatric cases. 10. Medical dictionary- Need no mention. Its the dictionary of medical terms and terminologies.